I hope everyone knows the terms from the title of the post. I thought quite a lot whether it was worth writing them or not. But nevertheless I will explain the meaning of terms. Cryogenic temperatures should be called temperatures below 120 K. Cryogenic devices are those whose actions are based on the use of superconductivity phenomena at very low changes. Further SRF – Superconduction Radio Frequency. 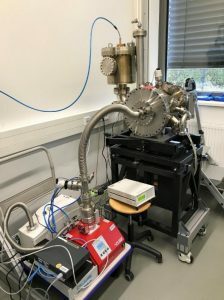 In the superconducting photoinjector of bERLinPro the photocathode (electron source) is held at 80 K. During operation the photocathode suffers from heat load due to RF- and laser power. A study was made of heat transport from the photocathode surface. Normal conducting CsK2Sb cathodes will be used due to their high quantum efficiency (QE) at visible wavelengths and fast response time. 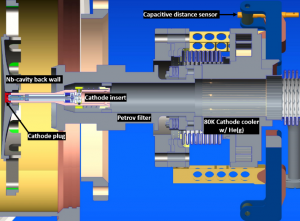 The cathode plug (red cap in Fig.) can be made of copper or molybdenum. Copper plugs will be used for the commis sioning of the injector with low bunch charge and molybdenum plugs will be used as substrates for the CsK2Sb cathodes. All available candidates, and especially CsK2Sb, require ultra-high vacuum environments to preserve the QE. With this pumping setup a final pressure of about 1×10-6 mbar can be reached. 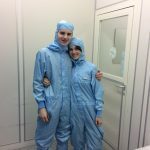 All UHV parts were cleaned carefully by e.g. blowing with ionized nitrogen, wiping with isopropyl alcohol or acetone. Standard UHV parts, screws, washers, nuts and bolts were washed in separate ultrasonic baths with and without Tickopur detergent solution in ultrapure and particle filtered water. To avoid galling of stainless steal screws and nuts, titanium (grade 5) was chosen as nut and stud material, which during mounting shows less generation of visible particles than CuNiSi. The experiment itself consists of several parts: cleaning and purging with nitrogen. Then use the Origin program to write down the initial data and get to work. Liquid nitrogen is then poured into the tank. Liquid nitrogen begins to cool the system, and the system has 8 sensors. In the experiment, the first half an hour we measure every five minutes, then every 10 minutes. The experiment lasts about 4-5 hours depending on the goals, namely: freezing to 90 K, slow freezing or to achieve the lowest temperature (80 K). Further during the experiment, the results are plotted and the occurring phenomena are described. Such 7 cooldowns have been produced so far at the moment. For now I can only say this. Of course there are a lot of problems with this experiment, which I can not yet voice. Thank you for your blogpost. You jump directly into the project, but what I miss a bit, is the context: Why is this project important? It is part of something bigger, is it? Thank you for your comment. This project is important for installing bERLinPro. How hot the cathode becomes and the temperature of its cooling.